I'm going to start off by being completely honest and admitting that I'd never have given Healthspan Nurture Protect Day Cream SPF 15 a second thought and certainly wouldn't have tried it, had it not been for the fact that I completely trust the opinion of their knowledgable PR. So.. what had put me off? Firstly, I associate Healthspan with vitamins and supplements and whilst we all know the importance of taking care of the inside of our bodies in order to look good on the outside, I wasn't convinced that they'd be able to create a skincare line to compare with my usual brands. I also feel that you should spend the most you can afford to on skincare and as an affordable range, I probably wouldn't choose this personally although I know that it's my duty as a blogger to review a variety of products at different price ranges. Finally, the packaging is clinical and bland. I doubt I'd even notice it on a shop shelf, let alone choose it. But it turns out that you really shouldn't judge a book by its cover. 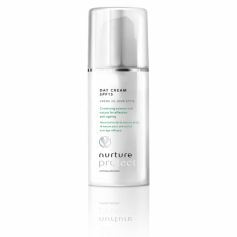 I was really impressed with Healthspan Nurture Protect Day Cream SPF 15. I've given it a fair trial, testing it for over a month without changing other aspects of my skincare regime. I still think that the presentation is aesthetically boring but I loved the functional pump dispenser. My only complaint would be that as the packaging is opaque, it's difficult to tell how much of the product is remaining. The cream itself feels rich yet is easily absorbed and didn't leave my skin feeling greasy. I like that it incorporates an SPF, something I wear every single day and which I feel justifies the "Protect" name, yet it doesn't feel heavy on the skin. A little goes a long way. It's fragrance free which might make it appealing to those with very sensitive skin, although I admit that I missed the luxury which I associate with beautifully fragranced products. By far the best thing about this product is the price. It's just £9.95 for 50ml. I know I said that you should spend the most you can afford to on skincare so this is something of a contradiction but I really was impressed at just how well this product performs for the price. It's quite a cultural change to use an affordable skincare product and something which I'm still getting accustomed to. However, I'd definitely consider repurchasing this, particularly if money was tight.